Deputy Tylun Campbell and K-9 Cheri visited third grade students at Southern Elementary on Thursday morning. RACINE — For students at Southern Elementary a story they have been reading was brought to life on Thursday morning. Third grade students have been reading about K-9 Aero and Officer Mike in class, learning about the life of a police officer and his canine partner. The story was written by Joan Plummer Russell. 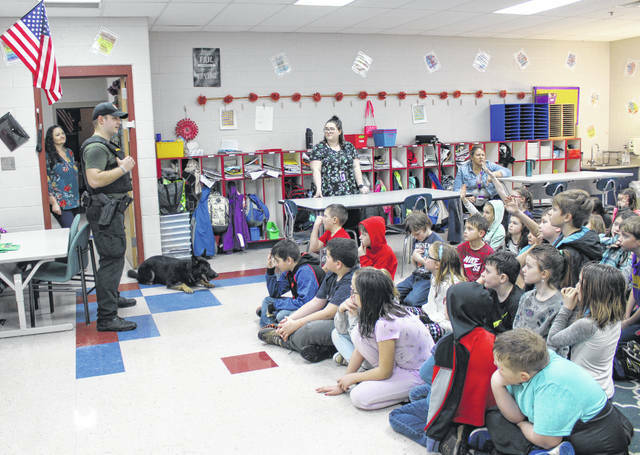 On Thursday Meigs County Sheriff’s Office Deputy Tylun Campbell and K-9 Cheri visited the students, showing some of Cheri’s skills and answering questions from the students. Before Deputy Campbell and Cheri arrived the students and their teachers talked about the story, the work that went into the author’s story — she rode with the office and canine twice a month for two years — and what type story it is. They also discussed possible questions to ask Deputy Campbell, including what makes a question versus a statement and what questions would be good to ask. While students were not able to actually ride along like the author did, they did get to learn about the life of a canine officer and see some of her training in action. Students were curious how high Cheri could jump; how fast she could run; what type training she had completed; and many other things. Deputy Campbell had two students hide items on the playground to demonstrate how Cheri is able to track the scent to the items. When she located an item she was then rewarded with her toy. Cheri also showed off her speed when Deputy Campbell tossed her toy across the playground. Deputy Campbell explained that Cheri will do what she is trained to do whether finding items, locating suspects or missing individuals, or finding drugs on a traffic stop, among other things. When she completes the task she is given the toy. https://www.mydailysentinel.com/wp-content/uploads/sites/14/2019/02/web1_2.8-K9-VIsit_ne201927123224335-1.jpgDeputy Tylun Campbell and K-9 Cheri visited third grade students at Southern Elementary on Thursday morning.